Today I went back to the Thursday Dharma class with Kelly Senn at Orlando Power Yoga. Again, this is becoming one of my favorite classes. She did say starting November it will be available twice a week. Not many emotions were flowing through me today. I am still busy and excited about things, but in more of a melancholy mood. Today I wanted to talk about the piece of art work above. I came across this at the art museum in San Francisco. 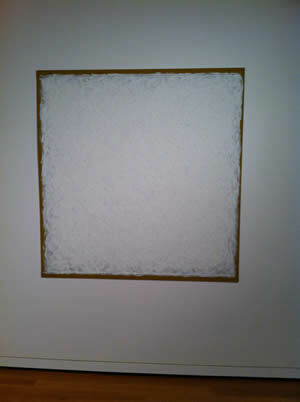 The above piece was done by Robert Ryman. He is 82 years old and this is what he paints. I looked at it as nothing, or as a blank canvas. This is art? He has been paitning these squares since the 1950's. A week later I was in the art museum in Seattle. Guess what I found? Another blank canvas by Robert Ryman. I didn't understand it. So I began to try to understand it. I found him on the internet and on a PBS program. My art is filled with what I am calling non patient work. I like to take at most 1 hour on a painting. This is the time period where I produce, in my head, the best works of art. I started to think about the reasoning behind this. This is often how our brains work. We want instant gratification. We want to just be the best at something, express ourselves, and be given the attention we deserve. We want this instantly though, we do not want to work at it. I have found a small niche in my life where I can get this instant gratification, and that is through my art work. However, I do not believe that true peace is found in instant gratification. True peace is not instant. We have o find a way to work at it. We have so much to overcome. Either are past builds up and creates barriers or we spend too much time worried about the future and what the world has in store for us. We ignore the now and stay in this worry mode. How do we overcome these worry's that have been installed in our brains? Practice, stillness, patience. The instant gratification only lasts for a bit and then it is gone. To find true peace we need to work at it, and be patient trying to find it. Today I was thinking of Robert Ryman's work. He seems to take a blank canvas and once again makes it into another new and blank canvas. Outside of art work, isn't this a great concept. What if we woke up every morning with a blank canvas? What if we had no worries from the past, and no responsibilites tied to the future. What if today was a fresh new start? What if we looked at this piece of blank canvas worked all day on it and the next day we woke up to a new fresh blank canvas? What if it wasn't every day, but every hour, minute, or even second? Is this possible? Can our society allow this to be this way? Can we allow this to be this way? My life's canvas is pretty colorful, brilliant, and exciting. There is just a small sliver from my past that I would like to erase or take out of the canvas, but maybe this sliver is what is needed to make it a true work of art. Maybe it is what makes my unique piece unique. It is what I need to grow and make my next more brilliant blank canvas. Maybe your life is full of these slivers. Rather then trying to remove these slivers from your canvas, accept them, and mold them into your new fresh new canvas. If you want to splatter color and joy onto it, do it. The slivers will still be there, but with a new look. Maybe your blank canvas is not blank at all. What do you think? Look outside the box. The things like Robert Ryman's painting may be the life lesson that you need today. Oh, I still do not think it is art, but I appreciate the understanding it brought to my life today. Yoga is a great place to bring to the table a fresh new canvas. Clear your mind. Let the emotions, feelings, and things around you go. Try to live in the now and create a fresh new life. On a side note. Today I have been thinking a lot of being back at the Costa Rica Yoga retreat at Anamaya. When I was there, my days were each a blank canvas. Marianne made this video, and it helps give a glimpse of how special this place was. Most of us did not know each other, but we all left great friends. Enjoy.